Welcome to finish it up Friday! I hope you all had a happy and safe Thanksgiving. I'm sad to see my favorite holiday over for another year, but we had a wonderful time with my family. I'm so very thankful that we don't have our house on the market like we did last year. What a relief THAT is! Since I neglected to pick a winner for the scraps on Wednesday, I'll take care of that today, too. The winner of the scraps is Betty! Thanks to everyone for sharing your answers. They were very fun to read! Now, let's talk finishes! Last evening I put the last few stitches in the binding of my little connections quilt while visiting with my sister. It was lovely! This quilt will be gifted to some friends for their little boy. I had the best time selecting fabrics from my stash for the project. I find it interesting (now that I'm finished with it) that there aren't any 'baby prints' in the quilt, but I still feel like it's very baby boy appropriate. I really love the simplicity of it. Let's hear it for a good blender print! 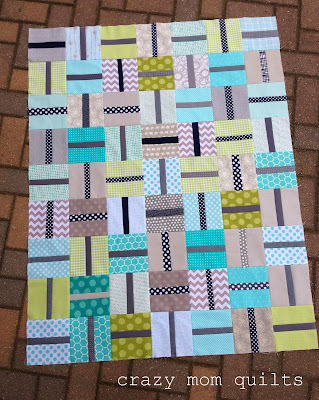 I had just enough length of the gray striped fabric on hand, so it became the backing. 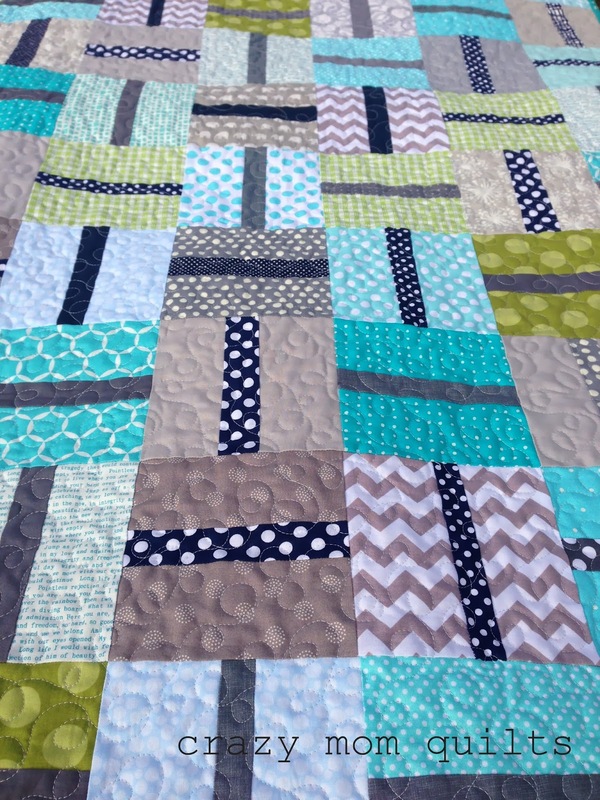 The teal colored binding creates a nice frame and finishes off the quilt beautifully. I quilted it with little loops all over. For the batting I used a bamboo blend which was LOVELY and soft. The slightly higher loft really shows off the quilting. I'm eager to wash it to see how the texture improves. 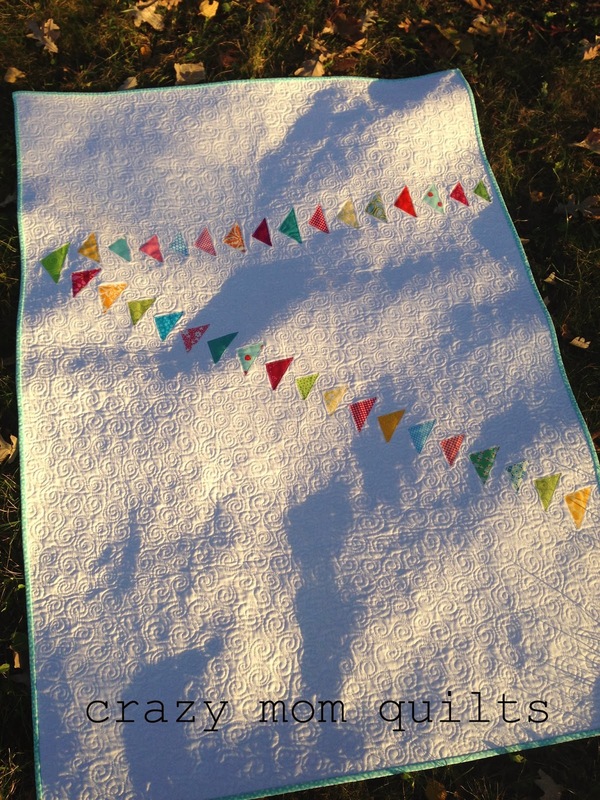 It's going to be one SOFT and cuddly quilt. The finished size is 38.5" x 49.5". 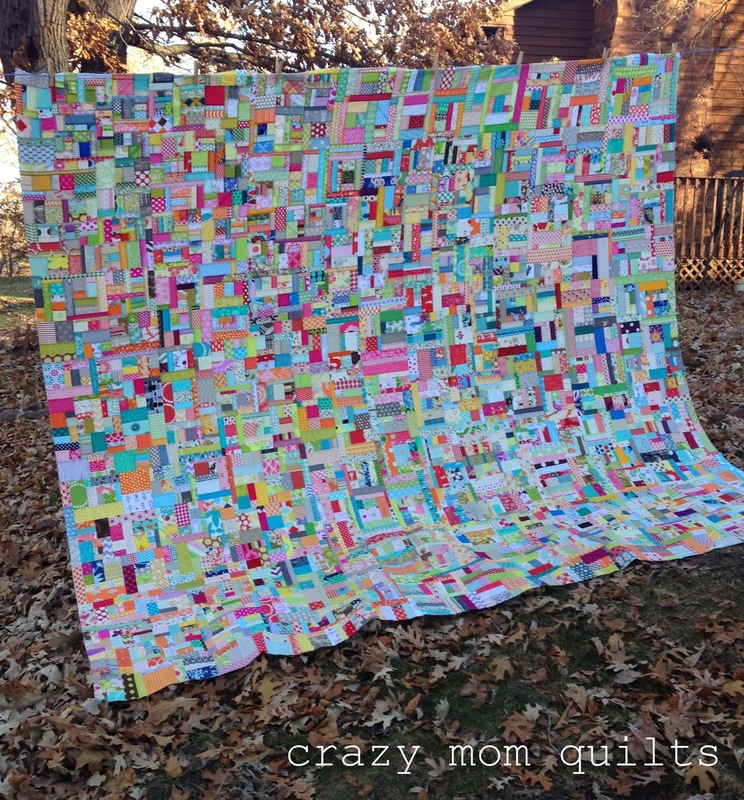 First off, THANK YOU for all your kind comments about my scrap vortex quilt! Since there were so many questions about the construction, I thought I would answer those here. 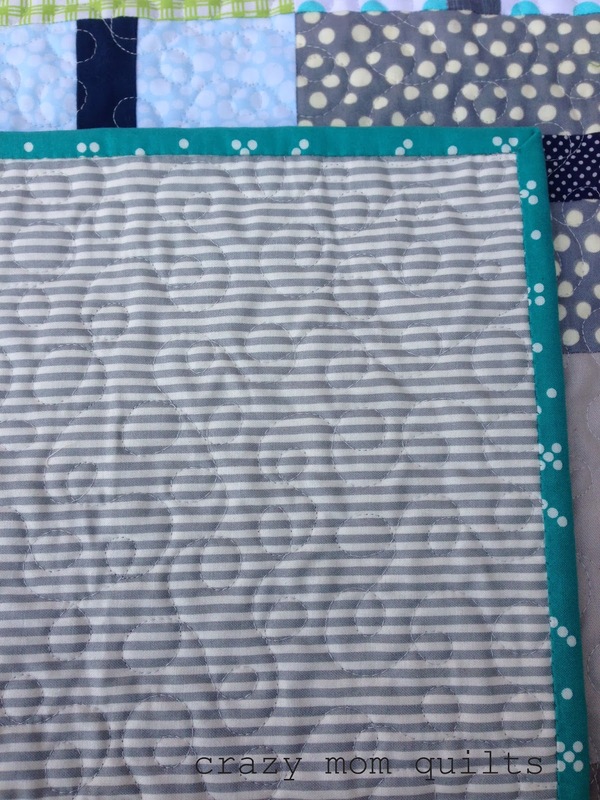 I used the slab technique, as found in Sunday Morning Quilts. I made several irregular sized slabs and joined them together like a puzzle. It takes a lot of rearranging and tweaking as you go, but it's so worth it! 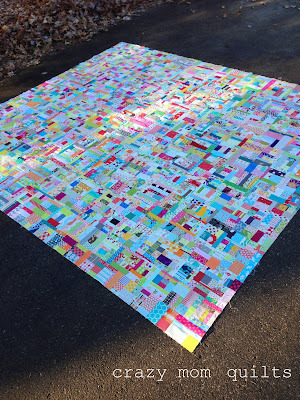 Just keep making slabs and joining them together until the quilt is as large as you want. And to answer another question that came up several times, YES, I still have scraps left. Always, always, always! 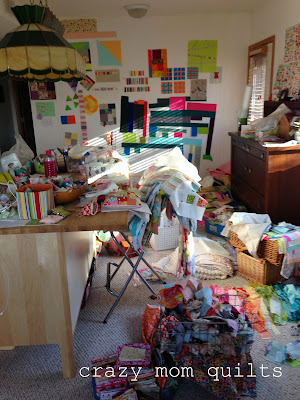 Since scraps are the subject of the day (and every day...ha ha! 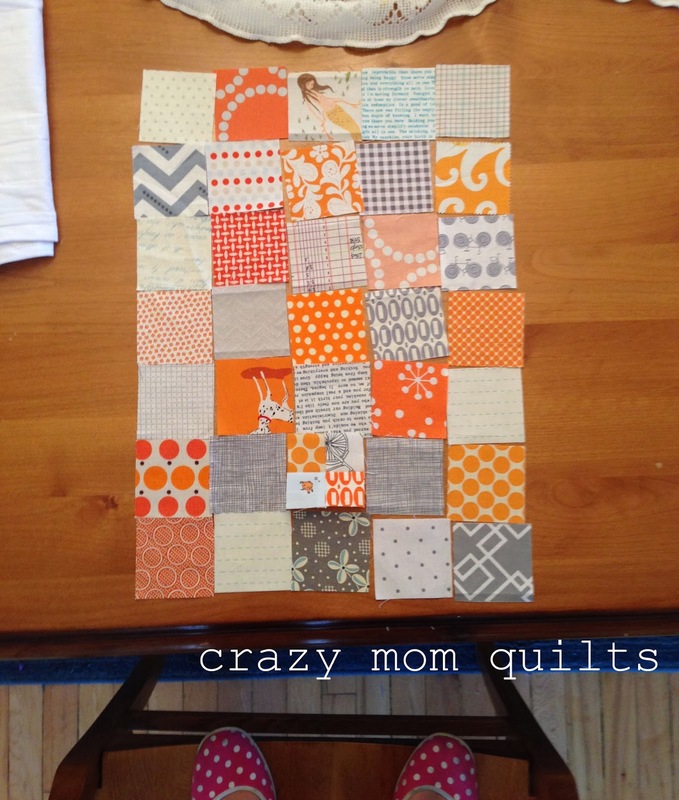 ), I have this pile of Denyse Schmidt Ansonia scraps to give away. The fabric isn't due to release until first quarter of 2014, according to the free spirit website. 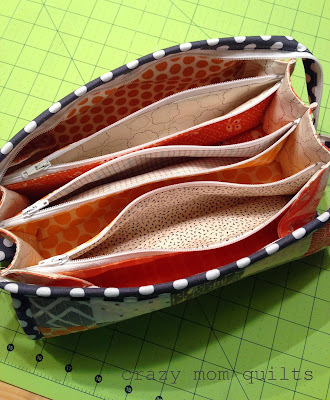 I have these leftover from making the scrap happy purse that I sewed up for market. (Pattern is available here.) 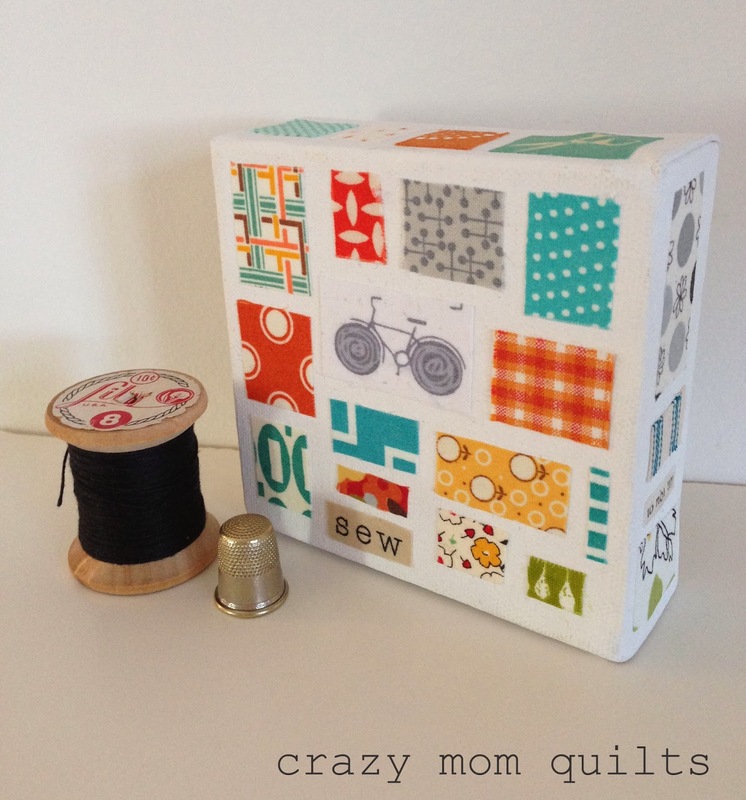 I have a small priority mail box FULL of scraps, ready to mail. (International entries welcome, as long as you are willing to pay the shipping overages if sent outside the US.) Please leave a comment on this post to be entered in the draw. The question of the day? If you could take a workshop from anyone, who would it be? Vicky asked me that question at retreat a few weeks ago and I thought that was a great question! I think it would be amazing to learn from Gwen Marston. A few more things...one comment per person, please. I'll pick a winner sometime on Wednesday. Phew! I think that's all. Today I've have a finished quilt top to share. Again. Last October I thought it was finished when it was a lap size, as you can see in this post. Then, in February, it grew to be a twin size, as you can see here. Last night, about 8:30 or so, I declared that the top is done for the third and final time. It's a KING size, measuring approximately 105" x 95". It's not a perfect rectangle, but I decided that was OK. This quilt is not about precision. It's about improvisation....or we could all it what it REALLY is....insanity. Ha! 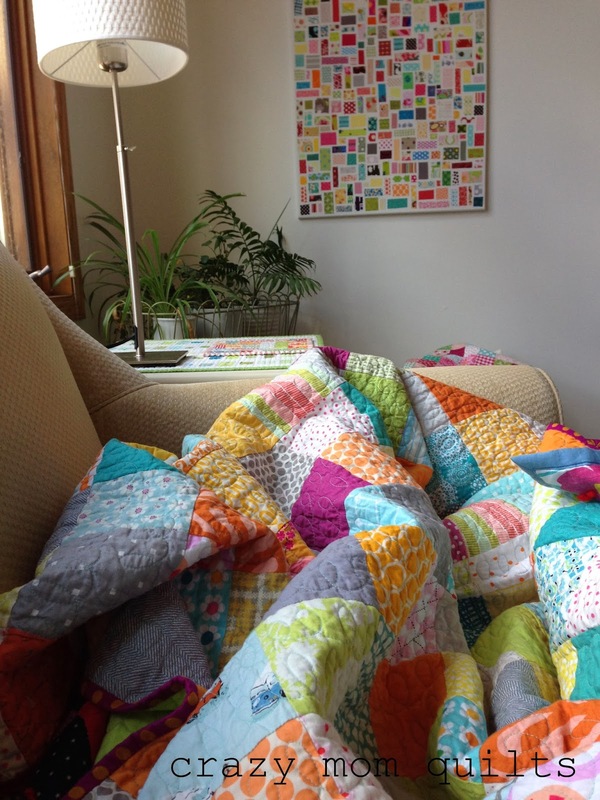 Taking quilt photos isn't my favorite, but this time of year it is especially tough. We have very little day light and it's darn cold out there. (12 degrees this morning. No wonder my hands froze!) But! 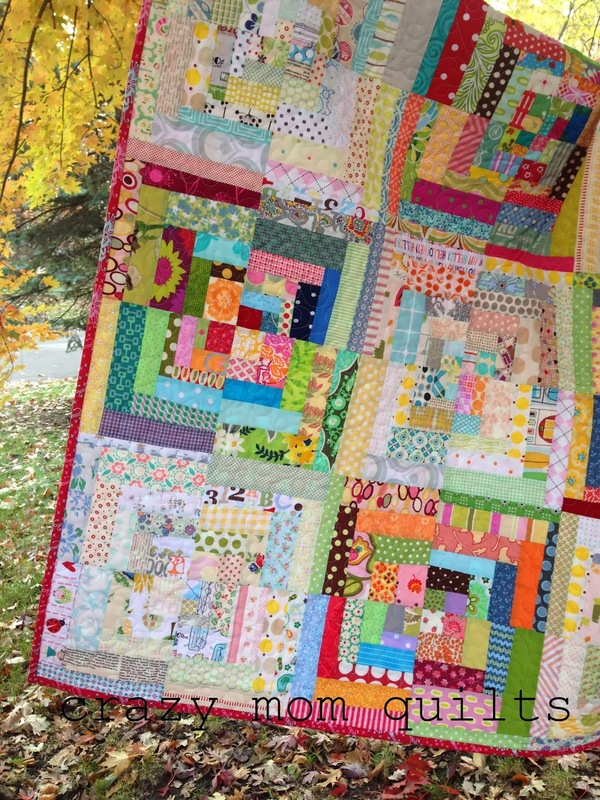 This weather justifies my crazy quilting habits, so I'll try to stop complaining! I tried it on my bed for size, then added a few inches for shrinkage. My last king quilt that I made barely fits my bed, for reasons other than shrinkage, but still, it's a total bummer after all that work. Better a few inches too big than a few inches too small! Today is a very happy day because I sent out my first wholesale order. That was one of my goals this year...to go wholesale with my patterns. I still have a lot of work to do, but I'm slowly getting there! I'm happy to be venturing into new territory, even if it is exhausting and a bit terrifying. My husband and I have been talking a lot about risk these past few days/weeks. I am such a chicken and crippled by fear in so many areas of my life. It's good to be breaking free from that just a little bit. It's refreshing! Here's to more of that! Just a little heads up....it has come to my attention that the original fabric bleaching tutorial that I wrote last week is incorrect. Please see the updated instructions in this post. If you want to read more on the subject, please read through this page. 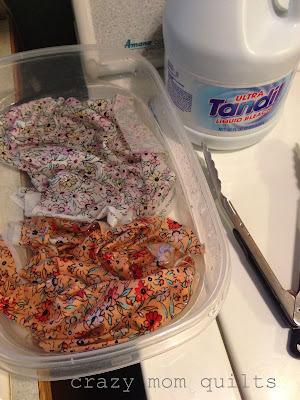 If you have already completed a project with the technique I shared, I'd recommend that you rinse your project thoroughly in a mixture of Anti-chlor and water to stop the bleach reaction on your fabric. I apologize for sharing incorrect information. 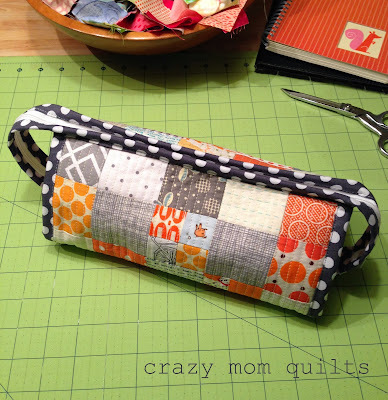 Last weekend at retreat I started making a sew together bag. I was happy because it has only been on my list for a YEAR! (only. ha!) 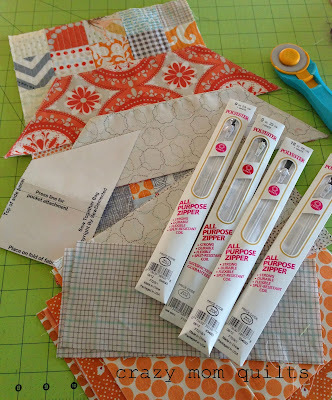 If you aren't familiar with the sew together bag, check out this post. It's brilliant! I use mine for carrying (and storing) all my sewing machine parts, tools and such. 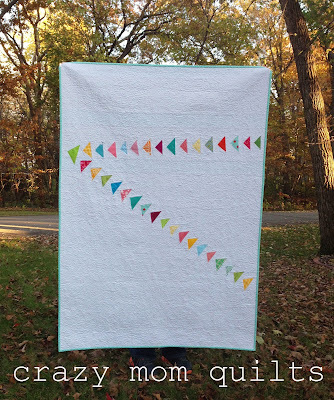 I was intimidated by the pattern because it involves 4 (!!!) zippers. But do you know what? It's totally worth it! I broke up the assembly over several days, which I think is best. 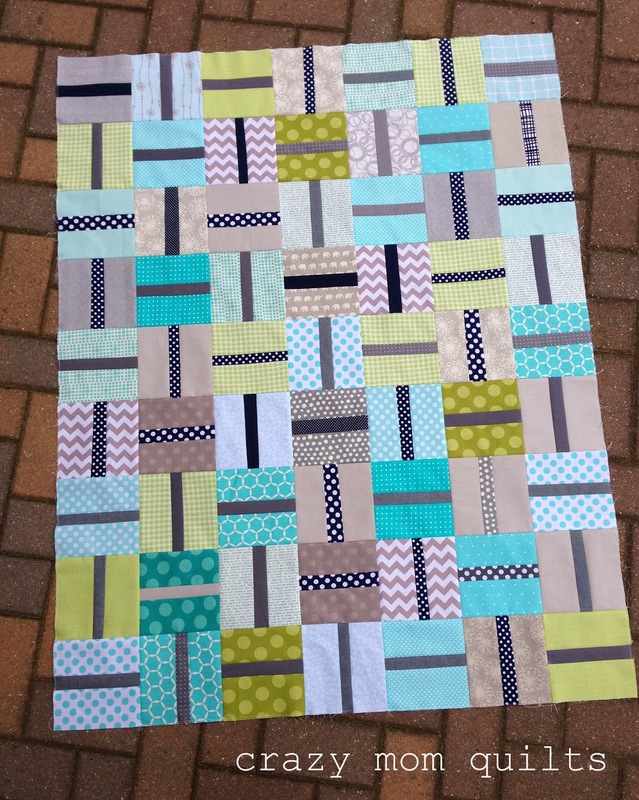 I made the patchwork panel, did most of the cutting and fusing at retreat. When I got home it was zipper time. 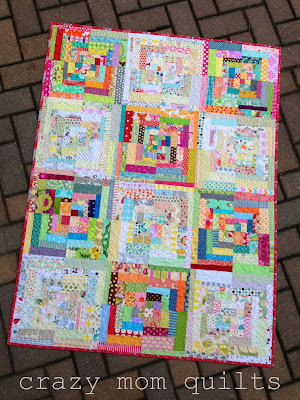 I could have easily stalled out at that point, but I was determined to finish this baby. It was super helpful that a few ladies at retreat made the entire bag over the weekend. I watched all the steps and tried to glean as many tips and tricks as I could. That helped a lot. Another thing that kept me from starting this bag was choosing a color scheme. It was hard to narrow it down, but once I found these orange and gray scraps, I knew I had my answer. I am SO pleased with the results! Here's the inside....all ready to fill with goodies! 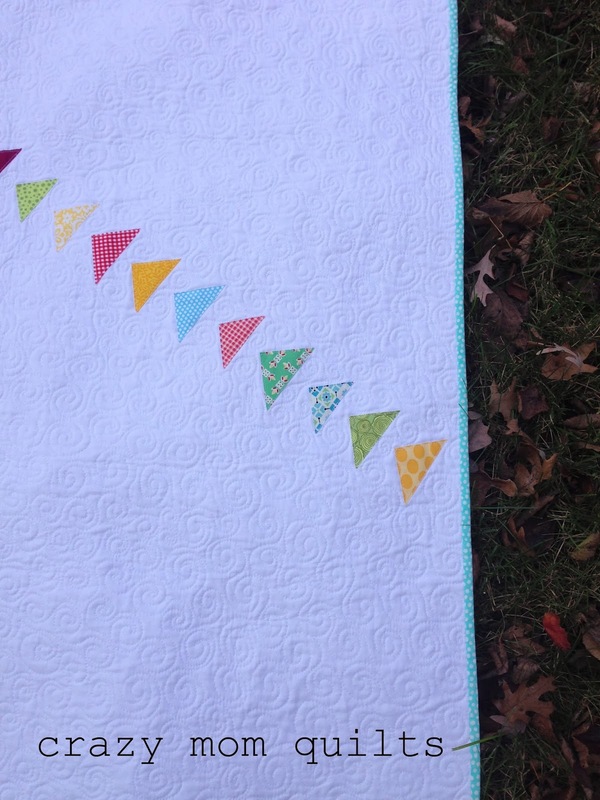 See that little bit of tiny patchwork? Those squares finish at 1". Definitely squeal-worthy. 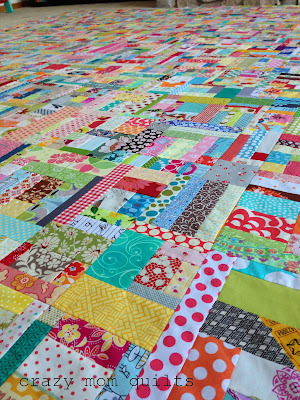 The rest of the squares finish at 2", my all time favorite. I know I don't need to state the obvious, but I LOVE this bag!!! 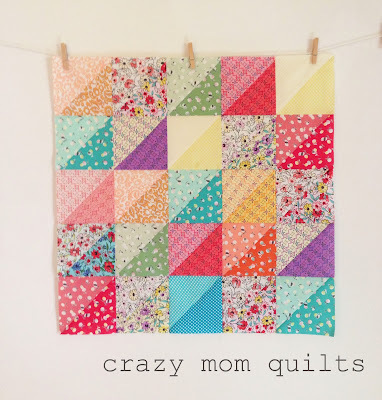 My kids all want one, so I'm gearing up for making at least 3 more! I'd better stock up on some zippers! 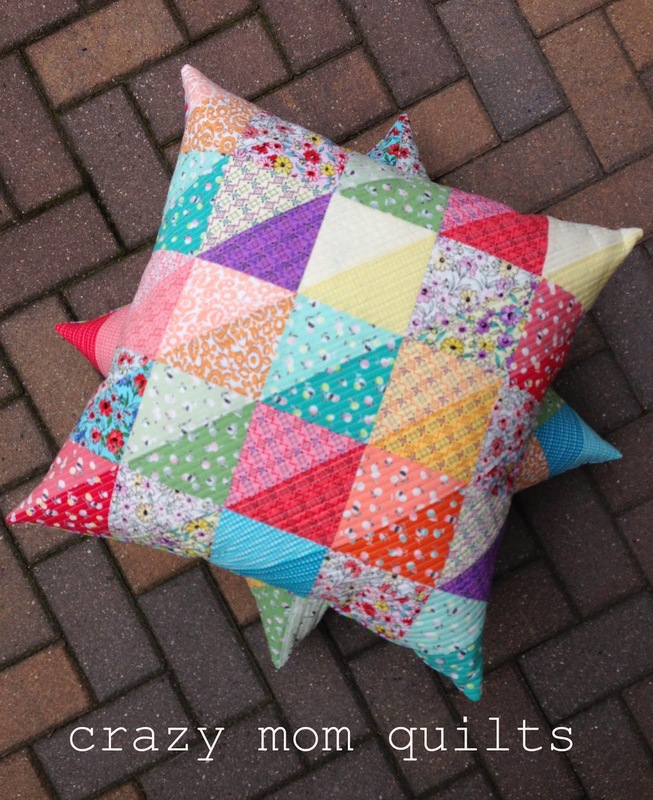 This is scrap project #24/101. Now it's your turn. Please link up your finishes! Happy, happy Friday to you! Also, trying to put a price tag on your work is incredibly difficult. I've come to the conclusion that sometimes, like Nike says, you have to "just do it". 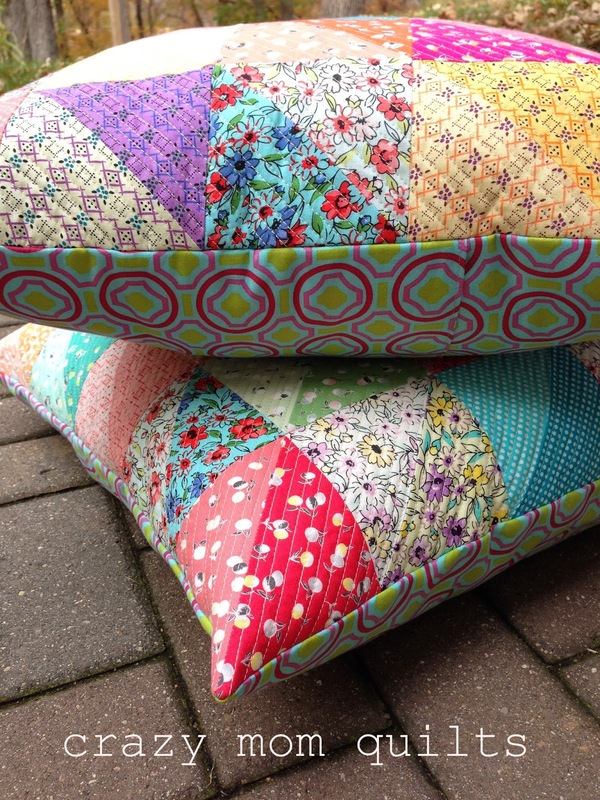 Thanks for all your comments on my valued pillows. As requested, I am happy to share a quick tutorial on how to distress/bleach fabric. Tara talked me through the process several weeks ago over the phone and was kind enough to give me permission to post about it here. 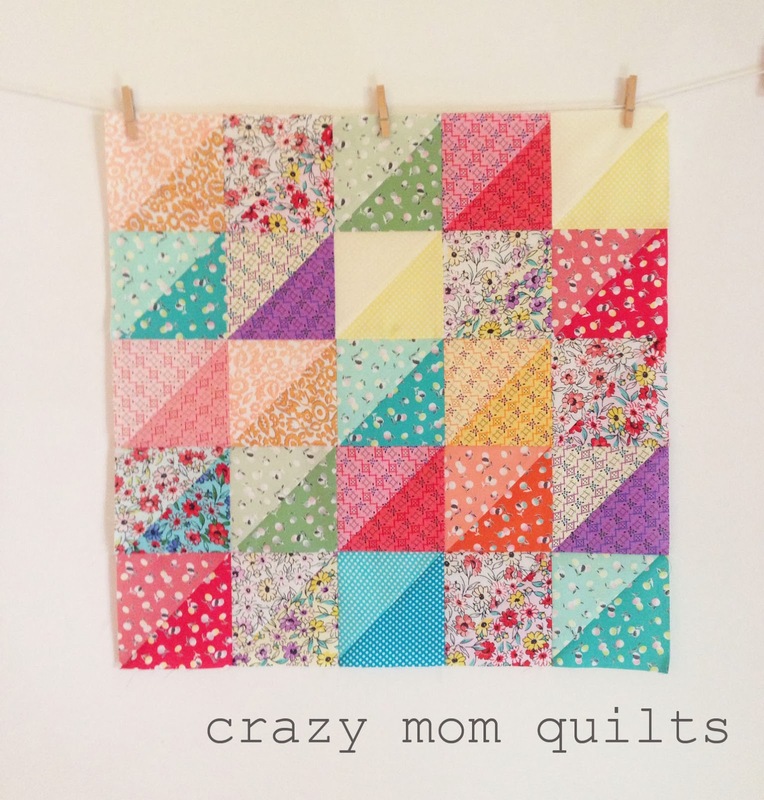 It's fun, quick and it will have you looking at your fabric in a different light. Be careful though, it's a little addictive. 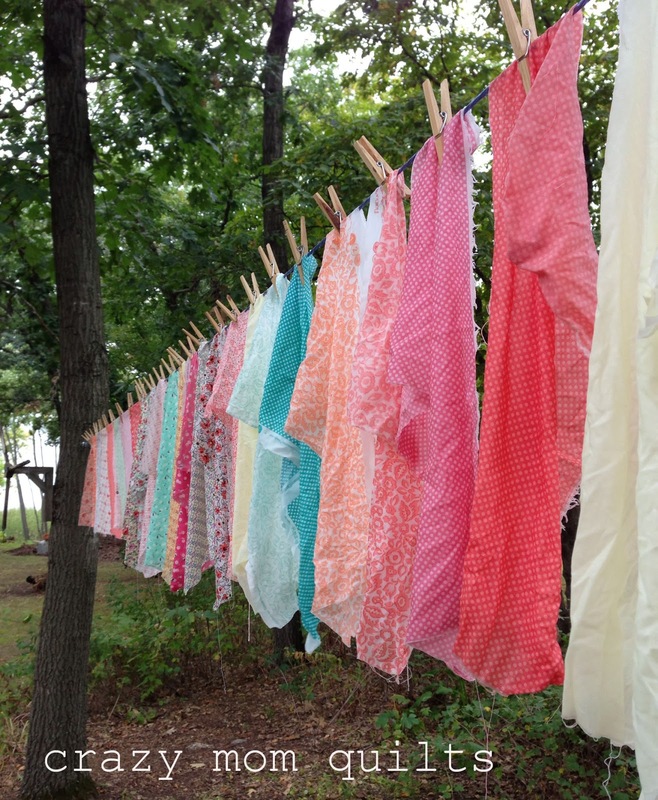 You may want to bleach every fabric in sight-just to see what happens! The fabric is Nana's pantry by Connecting Threads. 11/18/13 edited to add: it has come to my attention that vinegar is NOT recommended for this process. It could cause a reaction that could be harmful to you. Apparently the vinegar bath will not stop the reaction to the bleach and your fabric will eventually deteriorate. Please see the updated instructions below. I apologize for the mis-information. If you want to read more on the subject, please read through this page. 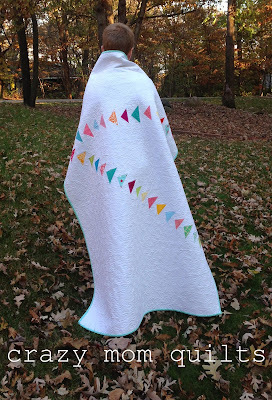 If you have completed a project with the technique I shared, I'd recommend that you rinse your project thoroughly in a mixture of Anti-chlor and water to stop the bleach reaction on your fabric. Prep your fabric. I started with a fat quarter of each fabric and cut them in half to yield fat eighths. 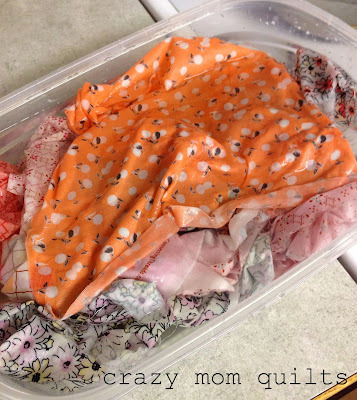 Set one piece of each fabric aside (control) and use one piece of each fabric for the bleach treatment. Take an ice cream bucket (or similar sized container) and fill it 3/4 full of water. Add between 1/2 to 1 cup of bleach. I didn't measure my proportions, so it may take a little playing around. Start on the conservative side. You can always add more bleach if needed. Fill an ice cream bucket 3/4 full of water, then add 1/2 teaspoon of anti-chlor. Mix to dissolve. Fill the third bucket with plain warm water. Take a piece of fabric and place it in the bleach water. 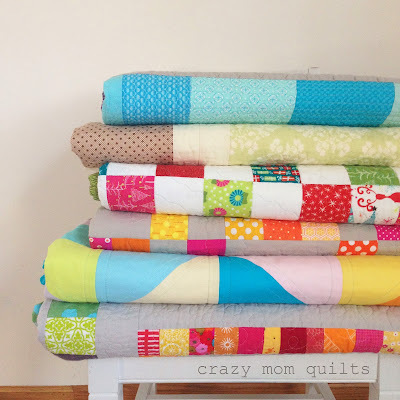 Use tongs or gloves to swirl the fabric around for a short time....start with only 10-15 seconds....then take it out. Let it drip just a bit, then place it immediately into the anti-chlor and water mixture. 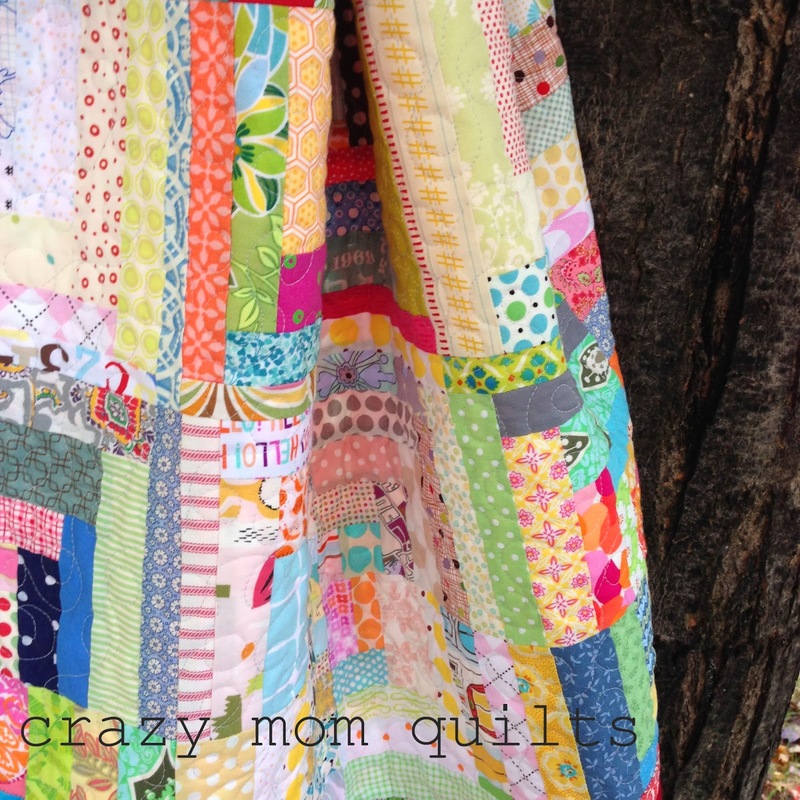 Swirl the fabric and let it stabilize. If your fabric hasn't bleached to your liking, you can put it back into the bleach and water mixture. Some fabrics bleach better than others. Some colors fade faster than others. ALWAYS place the fabric into the anti-chlor bath after it's been in the bleach bath. Don't exceed 45 seconds in the bleach water. Sometimes it takes a dip into the anti-chlor bath to see the reaction. Once the fabric is to your liking, place it in the warm water bath. Rinse thoroughly. Hang it on the clothesline (if you have one) and admire the beautifully faded fabric. Isn't that just the prettiest? I hope you give this technique a try. It was SO MUCH FUN to experiment and play. I was seriously giddy, and that was in spite of (not because of) the bleach fumes. Speaking of which, ventilation is a good idea. I'm happy to be home after a wonderful weekend retreat in Colorado. A huge thank you goes to Tara, for working her fingers to the bone to make this retreat happen, and for doing it so well! There was a lot of prep involved before the retreat...but it's all worth it. I made these name tags at the last minute. Each one represents a wonderful lady that attended. We had such a great group this year, as always. The subject of the retreat was a new class called "Make Good Choices: a color and fabric selection workshop." I was more than nervous (felt unqualified) to teach it, but I'm relieved that it went very well and everyone seemed to learn something. (phew!) I'm excited to have the first run of the class behind me and I'm looking forward to teaching it again, because it was a BLAST! 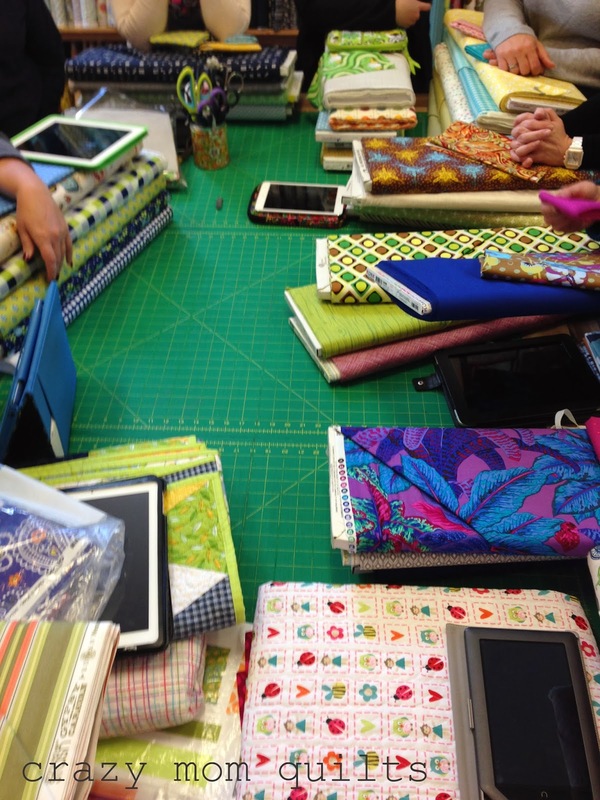 Angela of Mama Said Sew was kind enough to let us use her shop for a portion of the workshop. 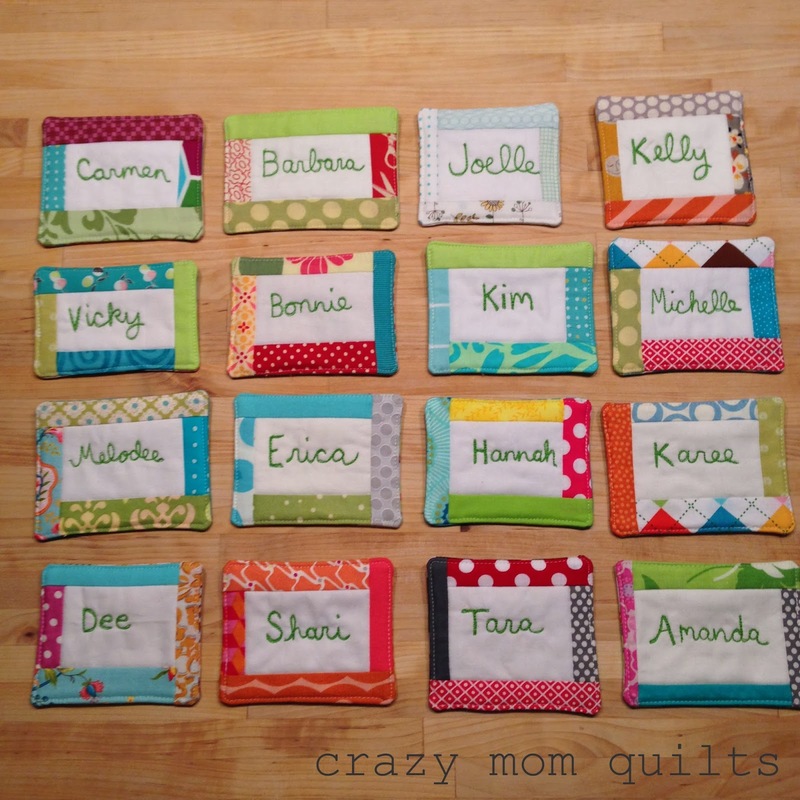 We had fun doing different fabric pulls. Combining fabrics is one of my FAVORITE things to do, and helping others get over their fears of doing so was extremely satisfying. I started a new little scrap project during open sewing time. 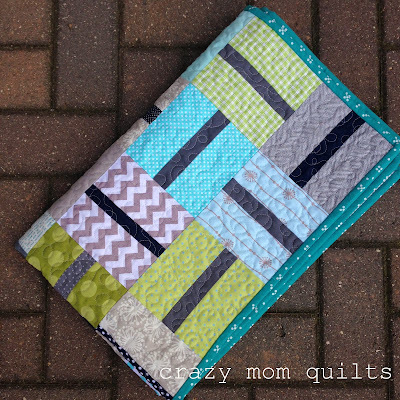 I'm excited to turn this into a sew together bag. Eeeee! Since there was much ramp up before the retreat, one of my goals this week is to hang out on my couch to do a little decompressing this week, because I am completely beat. We shall see how THAT goes. It's good to have goals, right? Directly opposing that goal, but also on the list for this week, I plan to clean up my craft room. We've lived here for 6 months now, it's time to set up my space properly. Maybe after I take another nap. This morning I am blogging from Colorado. It's retreat time again! I can hardly believe that this is year 5. I am a little sentimental about all of this because five years ago, here at the Inn at City Park, I taught my very first workshop. I'm ever so grateful that Tara invited me, believed in me and helped me get started on this path of teaching. Thanks for being such an amazing friend, Tara! For today's finish I have some throw pillows to share with you. 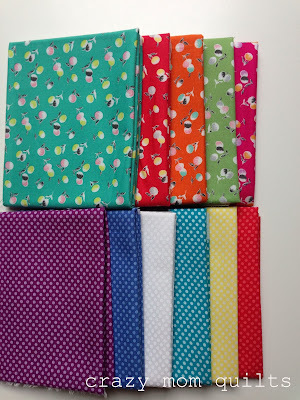 The fabric is a new line from Connecting Threads called Nana's Pantry. It's got a 30's feel to it, but the colors are bright. Now, I have nothing against bright colors, but I missed the feeling that these fabrics have been around a long time. I didn't want to wait several months while they faded on the clothesline, so I consulted with Tara (as I often do) and we decided that some compromising (fabric bleaching) was in order. I had so much fun playing with the bleaching technique! I bleached a fat eighth of each print and left a fat eighth of each print in the original state. When I combined the two, a little bit of magic happened. 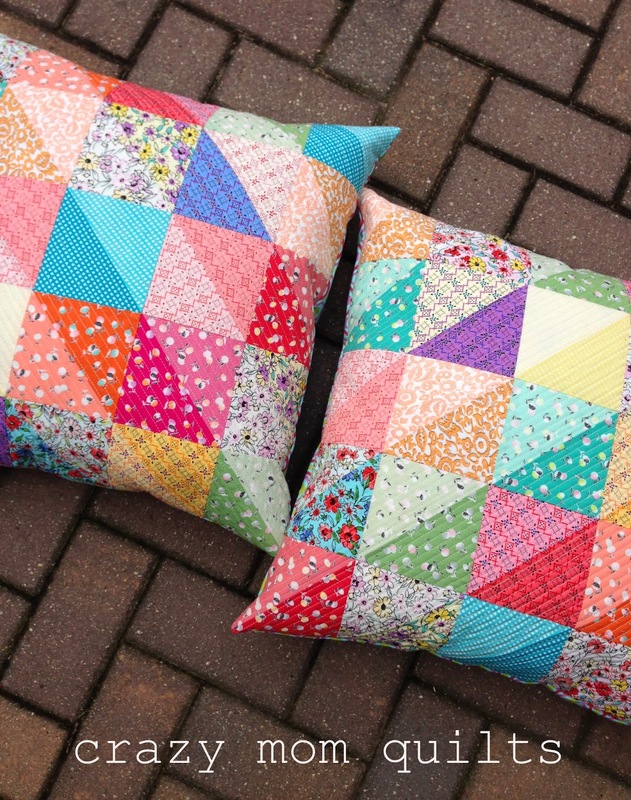 Pairing two different values of the same fabric has such a pleasing effect! 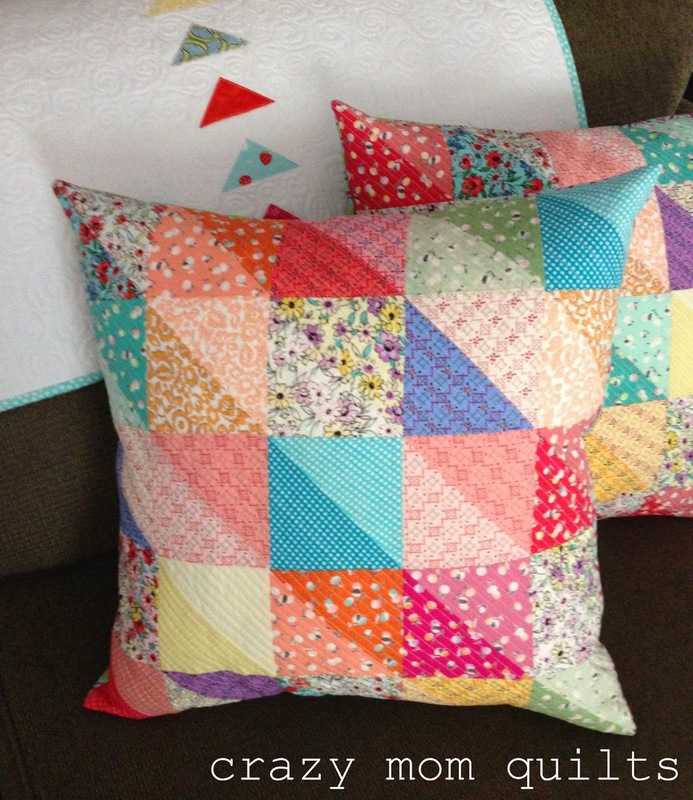 The pillow covers are quilted with straight lines about 1/4" apart and are finished off with an envelope backing. They measure (approximately) 20" square. Over the weekend my blog turned 7 (SEVEN!!!!) years old. It's kind of unbelievable to me that I've been at it that long. Then again, I barely remember life before blogging. It has brought along some amazing opportunities that I never dreamed I would have, and for that I'm very grateful. I'd like to take the time to say thanks to each and every one of YOU who stops by, reads and follows along. I appreciate your kind comments more than I can say! 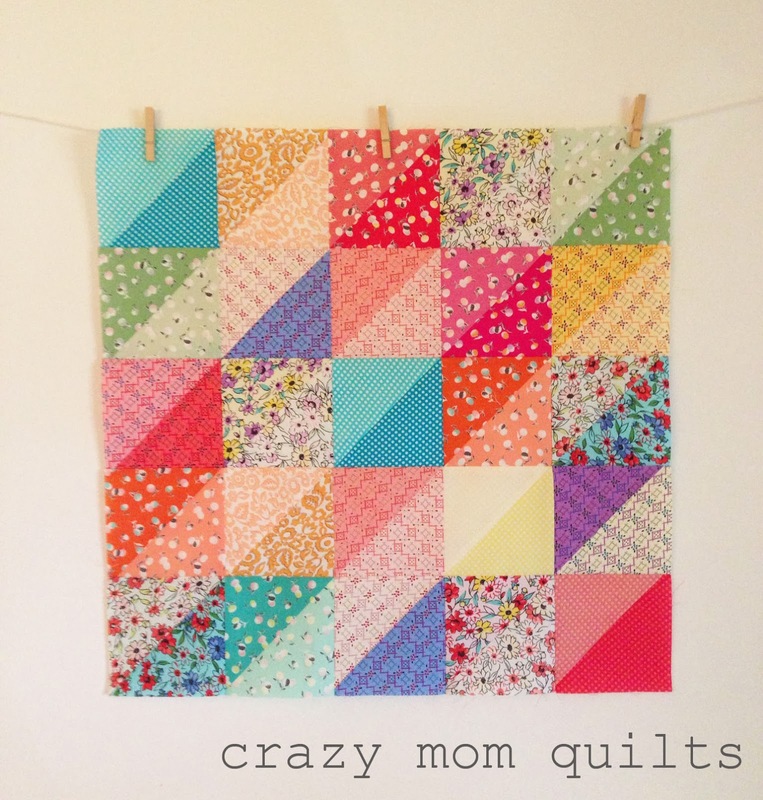 The idea of this quilt popped into my head all at once-title and all-as some quilt ideas do. I can still remember where I was walking when it came to me. I love it when the name comes to me at that time as well. It saves me the trouble of trying to be clever! :P I'm glad that I was able to translate it into fabric....because not all ideas see the light of day. There just isn't enough time! 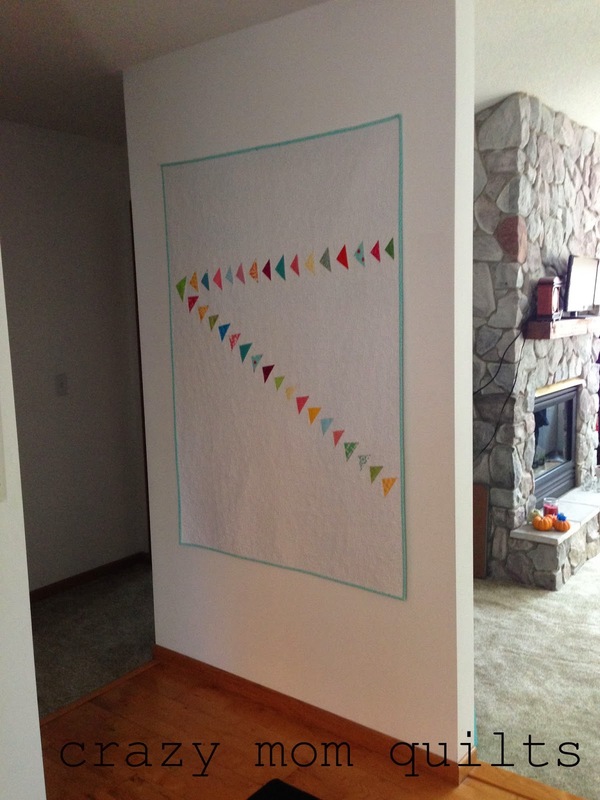 The geese are fused to a solid background, then the whole thing is quilted. I buried the knots on each individual one of the geese. It took awhile. 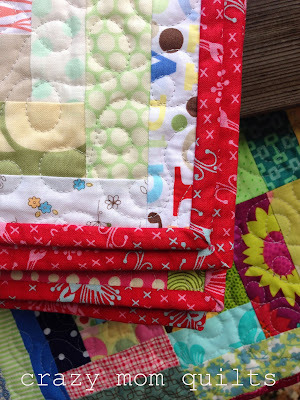 The quilting (which was done on my Juki) took a long time, too. It was a new-to-me quilting design at the time, and I really had to focus on what I was doing. I bet I looked a lot like Charlie Brown did (with his tongue hanging out in concentration) when he was writing to his pencil pal. 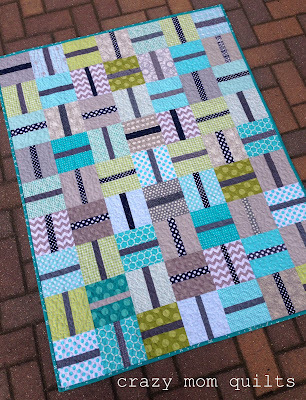 I am pretty comfortable with the design now, after doing a whole quilt's worth. I revisited it on this and this mini quilt. 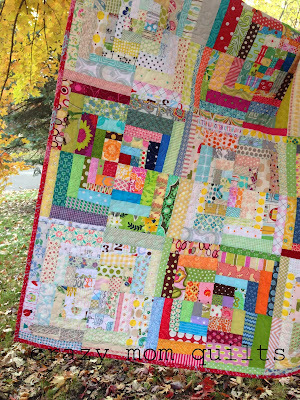 I love this photo because it shows the texture of the quilting and it almost looks embossed. This was an out take from the photo shoot, but this may be my favorite of all of them! 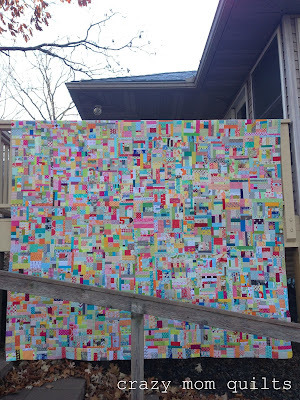 The quilt measures 42" x 60". 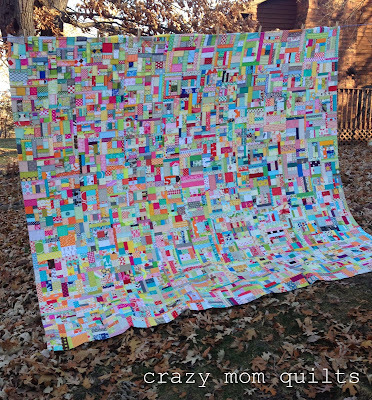 I started this quilt with 4 leftover blocks from Scrapper's Delight. They've been hanging around for much too long. 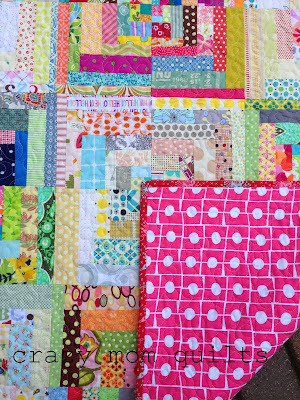 It's so great to have them IN a quilt....finally! This is actually a smaller version of Scrapper's Delight, but with a twist of separating the scraps according to value. I love, love, LOVE this quilt. I don't exactly remember when/why I thought to pair the original blocks with low volume blocks, but man, I'm glad that I did. 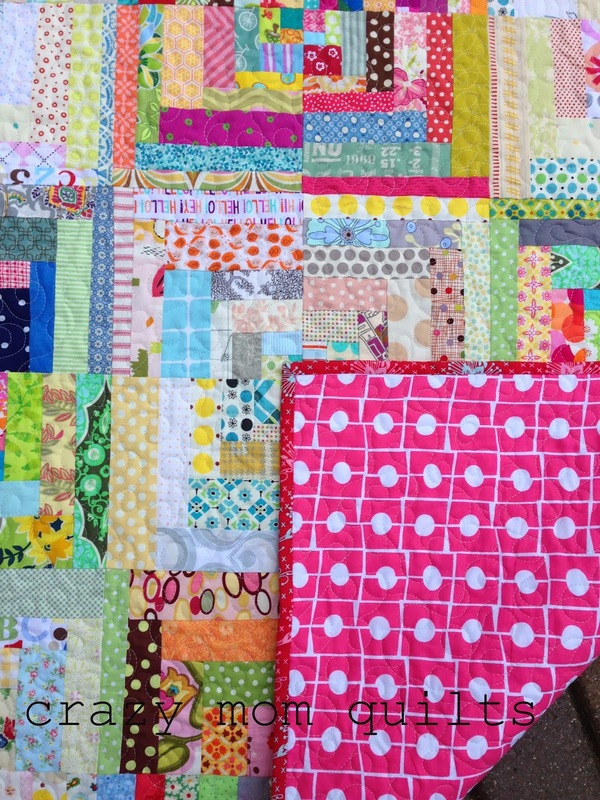 There are so many great scraps jammed into one small quilt. I could look at it for hours. 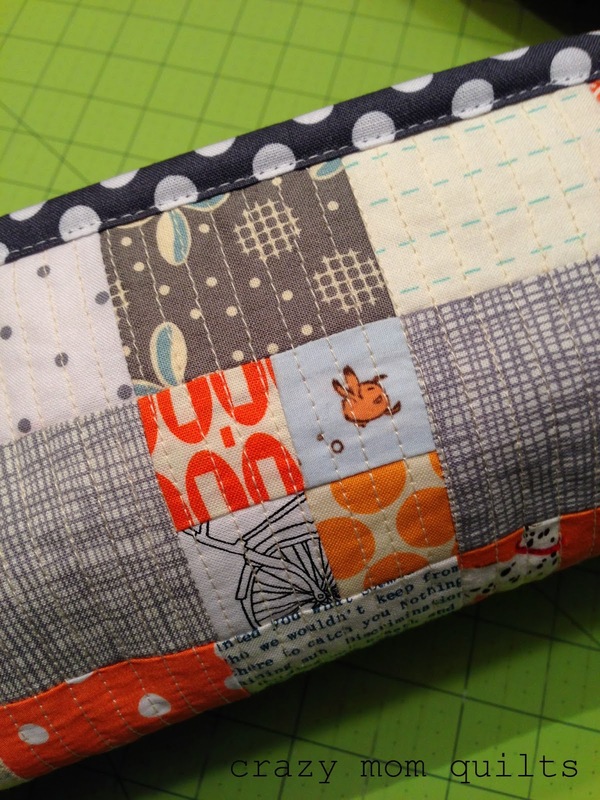 The backing fabric is one that I picked up on my SR Harris trip. It's wonderful to have backings on hand. It's even better that I'm USING them, because I can not wait to go back! Must. Sew. Faster. I quilted it with free motion swirls using gray Aurifil thread, 50 weight. There were LOTS of seams to quilt over. Oh, boy. 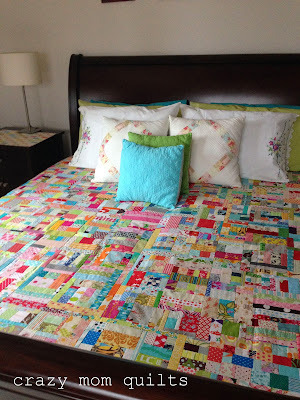 Good thing it's a small quilt! 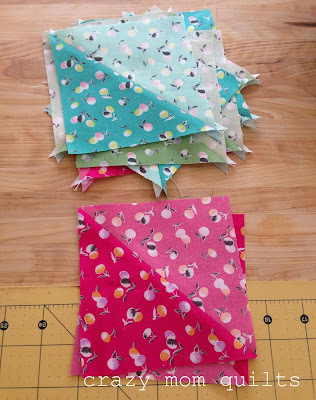 The binding fabric was hard to choose, mainly because of that bright pink backing. In the end I went with this lovely Anna Maria Horner print. The scale of the print is perfect, as is the color. Hand stitching it down was a delight. The quilt measures 36" x 48". This is scrappy project #23/101. Now it's your turn. Please link up your finish! Hope you have a fabulous Friday!